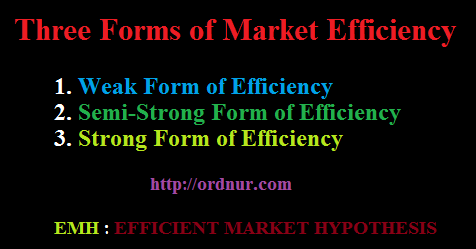 Home » Posts tagged "Example of Semi-Strong Form of Efficiency"
What are the Three Forms of Market Efficiency? In case of a weak form of efficiency, the current price of securities is fully affected by all the past information in the market, for this reason, you will not get any additional benefit if you work with historical data that is your decision is based on past information. Price should change time to time with the change of previously available information. Suppose the share price of Lanka Bangla Finance rises last seven days but we can not be sure that whether the price of the stock will increase in future or not because the price is already adjusted with the past information. Another capital market hypothesis is a semi-strong form of efficiency, where the current price of securities is fully affected by all past information and all publicly available information. If this form of efficiency exists in the market then you will not get any additional return in case of relying on the past price movement and information came from print or online media. For testing whether there is a semi-strong form of efficiency exists or not, you can test by two measures; one is checking how past information how it was adjusted with the price changes and the second one is how professional managers were performed in the market for making extra profit. Actually, in this world of capitalism, most of the capital market exists a semi-strong form of efficiency. Suppose IDLC finance announce that first week of the next month they will introduce a new financial product. After the announcement, the price of their stock in the market rises sharply. This means publicly available information creates an impact on the price of the stock but there is no influence of insider information. If this is the case then we can say that there is a semi-strong form of efficiency exists in the market. In a capital market strong form of efficiency exists when there is a reflection in the price of securities by the all publicly and privately available information. Here publicly information available through news briefing published a journal, research paper, market update or any other. And privately information is inside information can come from the insiders of the organization. But in the real world, there is no market where the strong form of efficiency exists. Suppose Union Capital is doing well in the financial industry and they officially declare that they will provide dividend at 30% of the par value of their share and also management is thinking that within next few months they will add a new business line with the existing product line. The thing is the information of dividend declaration is publicly available information and the introduction of a new product line is private information which is not yet publicly available. But if a scenario is there where the price of a stock is changed by the all these private and public information and known to the general public then that market will be considered as a strong form of an efficient market. The main difference among different form of market efficiency is the availability of publicly and privately available information and past information (historical data). Because these actually supposed to influence the market price of securities. The main thing is how the market behaves with the addition of new publicly and privately available information related to the market.